Currently browsing posts filed under "Steven Miller"
Thank you so much for doing what you’re doing. It’s finally time that the administration answers for its malfeasance. I have one: when Donald Trump was elected, many students were really upset by the result that many professors and deans allowed students to skip class because of how they felt, or (shockingly) because they stayed up watching the election. What is egregious, in my opinion, is the specific actions of the Dean’s Office. I was in MATH 341: Probability that semester, being taught by Professor Steven Miller. That week, we happened to be in the middle of a takehome period (Prof. Miller assigned a 30 hour take home to be completed anytime that week), and following the election, many of these upset students asked for an extension (even though we had a week for a test that took just ONE day!!!). Professor Miller did not initially grant these, because what basis did they have, right? Trump won, and while you may not agree (I personally wish the election had gone another way), but it’s no excuse not to do work or move on. These students, however, appealed to the Dean’s Office, and as a result, they actually told Professor Miller to move the deadline/grant extensions for his midterm. How do I know this? Professor Miller said “any extension will come from the deans” and the students who complained got their extensions. One classmate told me that it was all sorted out once her complaints reached Dean Sandstrom. Is this something we can do now when someone we don’t like gets elected? This is ANOTHER example of the Dean’s Office showing explicit, preferential treatment in the form of BREAKING ACADEMIC POLICY (when does Williams ever cancel or move exams?!) to coddle students it agrees with. The Dean’s Office does way more than just banning speakers. I strongly believe this undermines the point of a Williams education. Please continue revealing these irresponsible actions by that office. Emphasis mine. Thank you, Pissed Off Eph, for your tip and for allowing me to publish this in full. This email speaks for itself and hits all the right points. I will need more than one post to unpack this fully. This is the first. I have independently confirmed with classmates I know who took MATH 341 last semester, and, this actually happened. As a member of the Williams community I am embarrassed that the Dean’s Office acted like this. And I thought that the email Dean of Faculty Denise Buell encouraging professors to do this was already bad. I did not expect that the Dean’s Office would go so far to actually tell a professor how to do his job. With Dean of Faculty Denise Buell’s emails and the Dean’s Office’s actions, it seems reasonable to say this likely happened in more than just one class with more than just one professor. In which other classes did the deans explicitly instruct professors to cancel class/move requirement deadlines following last year’s election? Please let me know at concerned.ephs@gmail.com so we can catalog this. Who in the Dean’s Office issued this order (or orders, if this happened more than once)? Was it Dean of the College Marlene Sandstrom, as Pissed Off Eph implies, or was it Dean of Faculty Denise Buell, who sent the email that encouraged this behavior in the first place? Is this the kind of behavior we can expect from the leaders of the Williams administration? Did this happen in any other peer university?To the best of my research/knowledge, nothing of this sort (administrators telling professors how to do their jobs) happened in any other NESCAC or Ivy League college. In fact, in Columbia, the deans there explicitly told students they would not be instructing professors to move deadlines/grant extensions/whatever after students appealed to them. If the administrators at Columbia and elsewhere decided not to do this, then why did the Dean’s Office here decide on the complete opposite? What do our readers think of the deans’ actions? This reporting is made possible by tips from the Williams community, and future generations of Ephs are that much better for these. If you have any stories like these that deserve to see the light of day, shoot me an email at concerned.ephs@gmail.com! Quite interesting! At the other fly-ins I went to, for the first night, you were handed a meal ticket and pretty much left to shift for yourself at one of the cafeterias. Williams, however, has a whole separate banquet type thing, with catered food and huge tanks of iced apple cider, where student interns in the admissions office mull around and answer any questions that visiting students might have. I like this quite a bit. It gives the student hosts a break, it gives our visiting students more time in front of admissions office staff, and, it makes for a good venue to conduct introductions from. Any charms of the format wear thin by one’s second fly-in, usually. Mostly because there’s no variety between colleges. I visited three schools, hundreds of miles apart, in different athletic conferences and with radically different alleged styles of education; all of them subjected me to three acapela groups, two dance troupes, and some really maudlin, weirdly metered poetry. Seriously? We, purport to, and in fact have, a very rich trivial tradition at Williams. And this is the best we can do? I don’t want to put too fine a point on this (because WOW as a whole is great and my specific critiques should be read as footnotes to mountains of praise) but how fun is it to ask students to recall the name of an admissions director they’ve just met? And why the last question? Why are we bothering, even indirectly like this, to compare Williams to Harvard? It seems a slimy way to rub some of the Harvard prestige off on Williams. Why not ask a question about Pres. Garfield, or Leehom Wang? It might teach the youth something. My WOW, the October session, ended up falling on Mountain Day. I couldn’t imagine a better time to be on campus; the idyllic, sexed-up Williams that we ought to be showing prefrosh comes out on Mountain Day. Can we bring future WOW classes to campus during Mountain Day without spoiling the surprise? It’s my hope we can. Very good! Surprisingly good, actually. I was worried that, at fifty students apiece, the sample classes would be overcrowded, but, evidently there exist members of the Williams faculty that can teach fifty student seminars. Prof. Leyla Rouhi, in particular, had a sort of rockstar quality; there was a line of people waiting to speak to her after she finished teaching. I won’t say much about it, because unqualified praise doesn’t need the space. Interestingly, two Ephblog favorites, Prof. Joe Cruz ’91 and Prof. Steven Miller, were both in attendance at the October WOW. Prof. Miller even gave the whole room a neat little demonstration of Benford’s Law. That concludes our post today! Tomorrow, we return to the usual Ephblog listicle format as well as to reasonable standards of length. Consider this comment from ephalum regarding student complaints about Venker being allowed to speak at Williams. Sorry, Juan, but that comment reads like a self-parody (is it intended to be, perhaps I am missing something?) of the sorts of ridiculous overreaction to speakers whose ideas you might dislike, even find offensive or stupid. Having a speaker appear on campus who no one is under any obligation to listen to in no way causes tangible harm, let alone should be equated to the “dispersal of violent ideologies.” The answer to speech you dislike is more speech. That is fundamental to any discourse, whether political or academic. During my time at Williams we had plenty of speakers far more inherently offensive than this speaker on BOTH sides of the spectrum (Charles Murray, Nation of Islam leader Khalid Muhammed, etc.) but no one claimed to suffer any sort of psychological harm based on their mere presence on campus. (And in case you don’t know, I am a fervent liberal, but the few extreme voices from the far left trying to shut down discourse due to purported psychological damage are an embarrassment to the rest of us). Indeed. But where was ephalum four months later when Falk cancelled Derbyshire using, more or less, the exact same reasoning which ephalum mocked here? In particular, is Adam Falk (someone who has successfully “shut down discourse”) an “embarrassment to the rest of us?” And, if not, what distinguishes him from the students who protested against Venker being allowed to speak? PBK is dedicated to the principles of freedom of inquiry and liberty of thought and expression. We do not necessarily support the views and opinions of the speakers, but we strongly support the calls made by President Falk, William McGuire III ’17 and others on the importance and value of having civil discussions. There is a great opportunity in such debate, and we encourage all interested members of the community to come to these and other events and be heard. Many of the positions held by students and faculty on our campus today would not have found receptive audiences in the earlier days of Williams; ideas should be refuted by facts, not silenced. Talk is cheap. If Miller really believes in the “the principles of freedom of inquiry and liberty of thought and expression,” he will stand up to Falk. Tenure serves no useful purpose if it does not encourage professors like Miller to fight the administration about important matters of principal. Assume that Miller means what he writes. What should he do next? Star Wars: The Force Awakens opens in theaters on Friday and is rapidly consuming the cultural oxygen. 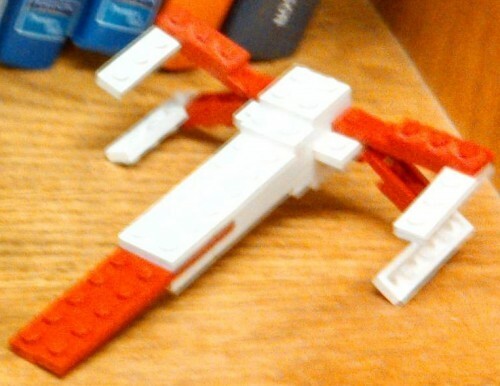 EphBlog is not a Force-free zone, and so we’re featuring a series of Williams College/Star Wars crossover posts. It was compressed pandemonium. In the center of each table there seemed to be a spinning tumbleweed of a dozen hands slapping small plastic bricks together again and again. After 9 minutes, 31 seconds, the universe’s most dangerous Imperial battle cruiser was intact and ready for flight. Williams College freshman Kent Blaeser, of Boxford, said he heard about last year’s attempt before he had even applied to Williams, and it helped attract him to the school. “And who doesn’t want to break a world record,” added Williams freshman Jack Lee, of Larchmont, N.Y. 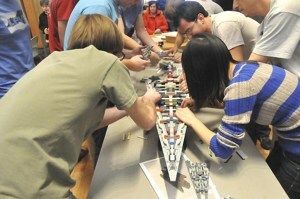 Assembly of the Super Star Destroyer. Credit: Record Photo Editor Christian Ruhl. Prof. Miller’s course highlights the wonderful nature of Winter Study. It’s true that a full semester mathematics course on combinatorics could incorporate a Star Wars themed speed-build project, but that would be an unlikely main goal. And a full semester course couldn’t use the lure of Lego construction as effectively to engage students from outside the Mathematics and Statistics department — something that can be done during Winter Study. But back to Star Wars. Just how big is that “real-world” Super Star Destroyer that they built the model of? People obsessed with Star Wars put a lot of time into questions exactly like that. One good estimate is from a blogger at StarWars.com, which pegs it at about 13.5km in length. So if you set the nose down on the Williams Inn, facing west, and laid the Super Star Destroyer more or less along Route 2, the tail would be about 1000 meters past the Hairpin Turn, overlooking North Adams. Anyone have some Photoshop skills to illustrate that? I’m an associate professor of mathematics at Williams now, but my academic career began as an undergrad at Yale in the 90’s. This post is parallel to Yale and Missouri, and a sequel to Uncomfortable Posting. For me, one of the purposes of college is to freely and civilly discuss and learn from each other. I am thus worried by recent actions at many schools, including my alma mater, where passions get so heated that this goal appears unattainable. I wanted to share some links as food for thought. I urge people to read these and related articles, especially the third link which is the article sent to the residents of Silliman, and reflect on the direction our nation’s campuses are moving. If we stay silent, it is other voices that will be heard and viewed as speaking for all. Greetings. I’m the faculty president of the Williams’ chapter of Phi Beta Kappa, the nation’s oldest academic honor society. As there has been a lot of discussion about speakers invited to campus by Uncomfortable Learning, I wanted to briefly post why PBK has decided to co-sponsor their next speakers. More highlights Steven Miller’s presentation slides (pdf) about the benefits of recording lectures at Williams. WHO watched WHAT and HOW MUCH? Should lecture recording be broken into smaller segments? Again, this is all good stuff. Have you watched the whole video? You should! However, I think that Miller fails to mention the most likely (and best) path forward for most Williams professors: being a curator rather than a creator of lectures. Miller is a fine lecturer, but is he the best lecturer in the world, on every topic in all of mathematics? Unlikely. Better for whom to collect and organize all the best lectures and then direct his students toward them. This frees up his time to do all the things for his students that they can’t get from video, especially working with students on projects. There are only so many hours in a day, even for someone as productive as Steven Miller. Every hour spent lecturing is an hour that could have been spent working with students either one-on-one or in small groups. That is a Williams education at its finest, that is our comparative advantage. Another highlight from Steven Miller’s presentation slides (pdf) about the benefits of recording lectures at Williams. lass (though I think it worked in large part b/c of Prof Miller’s way of teaching). Your website with many different kinds of practice problems, lecture notes, and additional comments with various links played an influential role to my performance in this class. I watched all the videos you sent via email and on GLOW. I watched some of the optional videos on the webpage when I had time or something I wanted to learn more about. flipping system and the available online resources – it really worked. All good stuff. Surely there must be another professor at Williams who records her lectures. Or is Miller the only one? But, again, recording lectures is a second best solution because the best future for Williams is no more lectures. [T]here would be no better way for Williams to demonstrate to potential applicants that it is a different place, with different values, than by drawing a line at 15 students or so per class. If Williams had no lectures, then there would be less doubt about its educational superiority. The tutorial program already provides Williams with a leadership position in undergraduate education. Abolishing lectures would do even more. Williams would be better off if every class taught by Steven Miller, and the scores of other excellent professors we have, were 15 students or fewer. There would be no need for recorded lectures if there were no lectures in the first place. What is the purpose of recorded lectures? More material (both at home and in class). Aids absent students / students who want to review. Use material as review / supplement in other classes. Good stuff. I love it when Williams professors experiment, when they try to push forward the frontiers of pedagogy. However, I predict that lecture recording is not the future of elite liberal arts colleges. The future is no more lectures. [Former Williams President] Schapiro claimed that, while discussion sections and tutorials in fields like philosophy and English are wonderful, it would be “stupid” to have discussion-sized sections for introductory classes in economics and the like. Nothing could be further from the spirit of Mark Hopkins. There are no lectures on the log. First, lectures are inefficient for students. Anything that a professor says in a lecture, as opposed to a discussion, could just as easily be typed beforehand and read by students at their own convenience. Reading is much quicker than listening and, more importantly, allows different students to focus on the parts that they don’t understand and to skim the parts that they do. Miller’s recordings are better than live lectures because it allows students who already understand topic X to fast-forward through that part of the lecture while students who have difficulty with X can easily repeat the same portion several times. My fellow EphBlogger, Professor Steven Miller, gave a talk at the 150th Anniversary of Phi Beta Kappa At Williams. Watch the whole thing! Is there a professor at Williams more engaged in attempts to improve/rethink undergraduate education than Miller? If so, tell us about her! EphBlog is powered by WordPress and delivered to you in 1.006 seconds using 38 queries..